Using the Milwaukee Deep Cut Band Saw is surprisingly easy because of its trim weight and nicely placed handles. The stationary band saw was a huge breakthrough in metalworking that gave us vastly expanded cutting capabilities. Now, the Milwaukee Deep Cut Band Saw further extends those capabilities to include just about anywhere in the shop, home or job site. And, for those of us who want and enjoy well-made tools the Milwaukee Deep Cut Band Saw embodies Milwaukee’s “Nothing But Heavy-Duty” tradition that ensures a long-lasting and always productive tool. Despite its impressive cutting capabilities the Milwaukee Deep Cut Band Saw is only 21"-long and weighs in at a trim 14.5-lbs! That means that you won’t get tired out by using a tool meant to reduce effort while increasing productivity. 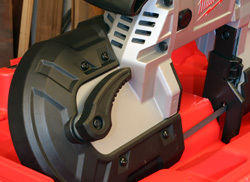 Despite the low weight the Milwaukee Deep Cut Band Saw sports something called Job Site Armor™ Technology, a proprietary composite material used on the outside of the Milwaukee Deep Cut Band Saw and designed to resist scuffs, scrapes and even impacts thanks to crush zones is especially vulnerable areas. 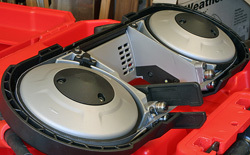 Despite the power, the motor housing (left) is very tri8m, giving you a clear view of the blade and cut lines. the grip is nicely shaped (right) with the controls in logical, easy to reach locations. The Milwaukee Deep Cut Band Saw is powered by a tough 11-amp motor that lets it power through the oversized 5” by 5” cut capacity. Milwaukee kept the housing that surrounds the motor very slim to help give the operator an exceptionally clear view of the cutting area. To insure long-term durability Milwaukee adds an all-metal direct drive gear system that is designed to be a bunch better than the chain drives featured on so many tools in this class. Milwaukee also developed a clutch system in the drive line that absorbs the shock of a stuck or jammed blade during a cut that could cause severe damage when sent through an unprotected drive system. This system also requires less servicing due in part to improved debris protection. This drive system also shields the pulleys from excess wear, substantially increasing their life as well. 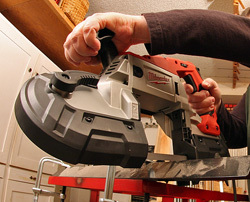 The Milwaukee Deep Cut Band Saw has two hand grips that keep the tool balanced for easier use. The rear grip is sort of a pistol grip with a pull trigger that works as an ON/OFF switch. A four position speed control dial lets the operator select the best working speed from the 0 to 380 SFPM. (surface feet per minute) The motor also has Milwaukee’s CPT™ Constant Power Technology that works behind the scenes to keep the blade speed constant during the cut. 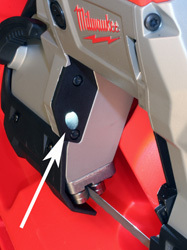 A rocker switch above the trigger lets the operator turn the LED work light on or off. The switch is covered with a rubber boot to prevent metal chips from contaminating its internal parts. The LED is built into the front of the cutting arch of the saw and shines across the work area to let you see layout lines and the material being cut clearly. A repositionable “shoe” lets you make tough cuts without fighting the impressive torque that the Milwaukee Deep Cut Band Saw generates. The shoe is adjusted in or out as needed to best fit the job with the press of its release button. This may seem like a small feature but once it saves you from a violent kick when the blade grabs you will be forever happy that Milwaukee included it! The blade path (left)k keeps you separated from the cutting edge during use, Ball bearing guides keep the blade moving smoothly. The tension release lever (right) makes changing blade very easy and very fast. The blade system is also both tough and very simple to use. Two large-diameter wheels with rubber tires actually turn and control the blade. Two ball bearing blade guides, one at each edge of the cutting notch also work to keep the blade running freely and true. Blade tracking and replacement is about as automatic as it can get. Flip the large tensioning lever on the front of the Milwaukee Deep Cut Band Saw and the tension is relaxed so that the blade can be slipped out of its track. Slip the new blade into place, flip the tensioning handle to tighten the blade and as soon as the motor is started the blade will settle into its proper track and you are ready to go back to work. The Milwaukee Deep Cut Band Saw uses a 44-7/8”-long blades that are ½”-wide and .020”-thick. Milwaukee recommends bi-metal blades and offers them in 6, 8, 10, 14, 18 and 24-teeth-per-inch models. If one of those does not handle your needs you really need to rethink your intensions in the metalworking world. The Milwaukee Deep Cut Band Saw just feels like power and quality when you hold it but putting it to steel removes any remaining doubt. The Milwaukee Deep Cut Band Saw has plenty of power and runs very smoothly, both of which make it easy to cut steel precisely where you wanted to cut it. The grips are comfortable and tend to put the tool in the right attitude for making square cuts. Both handles are sized to be comfortable to a bare or gloved hand. You still have to align the blade with the cutline but even that is made easier because there is nothing hindering your view past the slim motor housing. The trigger-style ON/OFF switch is comfortable to reach, as is the variable speed dial above the trigger. The LED work light does a surprisingly good job of illuminating the area surrounding the blade. I like that this LED has its own switch so we can turn it off when not needed. The speed control dial and LED ON/OFF switches (left) are easy to reach. The LED worklight actually lights up the cutting path (right) which helps accuracy a bunch. Changing blades on the Milwaukee Deep Cut Band Saw is very easy and surprisingly quick, in part because the final alignment is automatic. The large tension lever is easy to operate and actually does loosen the blade sufficiently for you to slip it off of the wheels. Slide the new blade into place and then flip the tension lever back to apply tension to the blade. 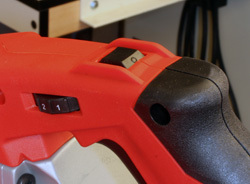 Plug the Milwaukee Deep Cut Band Saw in and give the trigger a squeeze and the blade moves into its final position. Though I cut every thickness and shape of steel I could find in my shop the Milwaukee Deep Cut Band Saw didn’t balk at any of them. Your job is to set the blade on the cut line, make sure that the shoe is adjusted and against the steel and then pull the trigger. There is no need to force the Milwaukee Deep Cut Band Saw through the metal, just let its own weight determine the feed rate while you spend your time guiding the blade down the cut. You do want to be ready for when the blade exits the steel on the other side because that frequently occurs before you expect. 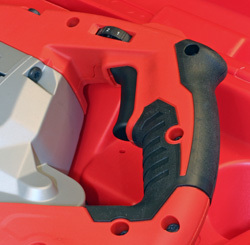 The Milwaukee Deep Cut Band Saw is another example of Milwaukee Tool’s dedication to producing quality power tools that function better than expected. The Milwaukee Deep Cut Band Saw is durable, well designed and functions smoothly and predictably. Cutting steel just does not get much easier unless you have someone else do it. The Milwaukee Deep Cut Band Saw comes with the features that we need and none of the glitz and fluff some companies use to make you think that their tool is worth the purchase price. To sweeten the deal Milwaukee adds a full protection carry case and a free blade to the kit reviewed here. Considering that the Milwaukee Deep Cut Band Saw has a suggested retail price of $400.00 and an expected street price of $299.00 it could very well be the value of the year if you need this kind of tool. 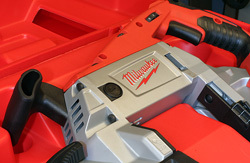 I should note that the Milwaukee Deep Cut Band Saw is due on the market in full distribution in January of 2012.